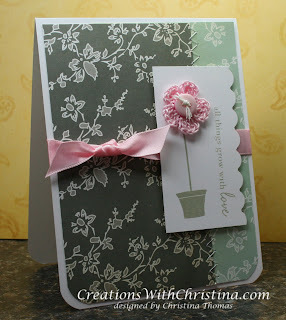 Here's a card that I made using the new stamp set from Paper Trey Ink called Everyday Buttons. I love this stamp set, the only thing you have to do is stamp and add a cute little button to complete the image. Supplies: Cosmo Cricket-Something True pattern paper, Paper Trey Ink- Sweet Blush Satin Ribbon , Sweet Blush Vintage Button and Everyday Button Bits stamp set; Stampin' Up!-Whisper white cardstock and Sage Shadow classic ink, other supplies-linen thread, adhesive, sewing machine, crochet flower made by Carol (AKA Mom), Fiskar corner rounder and Fiskar scallop edge punch. I have been wanting to order these stamps. I just love them.... Your card is darling. Love the new stamp set, I'd love to get that, I have so many buttons to use. You always do such great work!! Christina, as always your videos are so neat to watch! :) I sure wish I a) had a sewing machine and 2) knew how to sew! (not in that order!) ;) Thanks for sharing your video! Thanks for sharing your video. I have only made 2 cards so far since I mostly scrapbook but after seeing what everyone on the message board does with their cards I might start. Your video gave me another idea that I would like to try. Thanks! Very pretty card and fantastic video! You ROCK!